Our cover depicts Erich von Tschermak-Seysenegg (1871-1962), a man , long cited as one of the three rediscoverers of Mendel's work. Recently, however, his claim to a share of the honors along with Correns and De Vries has been challenged (see, for example, Monaghan and Corcos, J. Hered. 77:468-469. 1986.). Nevertheless, Tschermak is amply distinguished on other grounds to warrant a place on our cover. The rendering, by Ms. Elaine Gotham of our Publications staff, is from a photograph which appeared in Genetics, Vol. 37 (January 1952). The photograph was taken at a late stage in Professor Tschermak's life. Accompanying the photograph in Genetics is an account of Tschermak's life and works written by the late George H. Shull, himself a famous geneticist/breeder. Born in Vienna in 1871, Erich von Tschermak was a member of an intellectually distinguished family. He was the grandson of Eduard Fenzl, a professor of botany under whom Gregor Mendel studied. Tschermak gained considerable experience in practical plant breeding both before and after receiving his Ph.D. at Halle in 1896. 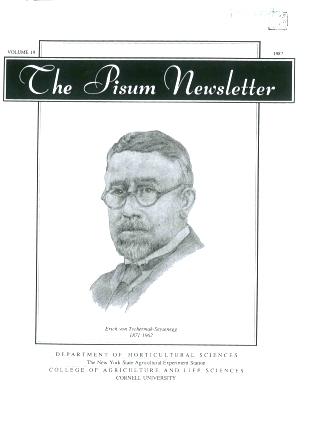 In Ghent, in the spring of 1898, he began his studies with the hybridization of garden peas. He continued this work upon returning the next year to Esslingen, near Vienna. A paper summarizing his results was read in January 1900. Dr. Tschermak experimented with many major crop plants during his professional career, making numerous valuable contributions to breeding and genetics and earning a host of honors and awards. During this time he published important papers relating to the genetics of Pisum (1901, 1902, 1904, 1910, 1912, 1916) including the discovery of several genes. THE EFFECT OF VARIOUS SUBSTANCES ON IN VITRO ROOTING OF TWO PEA GENOTYPES. T. Cardi, E. Filippone, and F. Adamo . CYTOLOGICAL STUDIES ON THE PROGENIES OF TETRAPLOID PLANTS OF PISUM. C. Conicella and A. Errico. IMPROVEMENT OF THE SELECTION VALUE OF GENE dgl THROUGH RECOMBINATION. MUTANTS DEFECTIVE IN SYMBIOTIC NITROGEN FIXATION. COMMENTS ON THE CHROMOSOME MAPS OF PISUM SATIVUM. LOW PENETRANCE AND VARYING EXPRESSIVITY IN A CHLORAMPHENICOL INDUCED PEA MUTANT. DETERMINATE GROWTH HABIT (det) IN PEAS: ISOLATION, SYMBOLIZATION, AND LINKAGE. SINUATE LEAF sil LINKED WITH Wsp. SUPPLEMENTAL LINKAGE DATA FOR CHROMOSOMES 1 AND 7. ADDITIONAL EVIDENCE PLACING Rb IN CHROMOSOME 3. ON THE GENES FOR RESISTANCE TO FUSARIUM WILT. LINKAGE DATA FOR dne AND CHROMOSOME 3 MARKERS b AND st.
A COMPARISON OF THE OPTICAL PROPERTIES OF gp (YELLOW) AND Gp (GREEN) FRUITS. LIST OF GENES IN PISUM SATIVUM FOR RESISTANCE TO VIRUSES. OBSERVATIONS ON THE RELATIVE ELECTROPHORETIC MOBILITY OF PISUM SEED AMYLASES. INTERNODE LENGTH IN PISUM: A FURTHER MUTATION AT THE la LOCUS. UPDATE, PISUM GERMPLASM AND PEA SEEDBORNE MOSAIC VIRUS IN NORTHERN INDIA, 1987. INTERNODE LENGTH IN PISUM: EFFECT OE THE GENE art (arthritic) . IN DIFFERENT MUTANTS OF PISUM SATIVUM. GENETIC STUDIES OF SEMI DOMINANT MUTATIONS IN PEA. ORANGE COTYLEDONS (Orc) AND ORANGE LEAVES (orl_) : NEW GENES ON CHROMOSOME 1. A SECOND costata GENE lum-2 ON CHROMOSOME. I.
DETERMINATE GROWTH (det) IN PISUM: A NEW MUTANT GENE ON CHROMOSOME 7. GOLD NECROSIS (gn): A NEW GENE ON CHROMOSOME 5. CONFIRMING DATA FOR MAPPING ISOZYMIC LOCUS Aat-p. IN PEAS (Pisum sativum L.). A NEW MUTANT PRODUCING LOBATE LEAFLETS IN PEA (Pisum sativum L.). OBSERVATION OF LINKAGE BETWEEN Wsp_ AND THE ISOZYME LOCUS Alat-p.
Adh-1, A MARKER LOCUS FOR RESISTANCE TO PEA ENATION MOSAIC VIRUS. A NEW GENE (1st) WHICH INFLUENCES STANDARD SHAPE IN PISUM SATIVUM. SISTER CHROMATID EXCHANGE (SCE) IN PISUM SATIVUM. DRY PEA PRODUCTION IN CANADA. A MATERNALLY INHERITED GENE FOR CYANIDE RESISTANT RESPIRATION IN PEA.